Are you looking to hire an LED dance floor in London & Surrey? We stock a range of dance floors for rental. We can either supply these in white or black. Are you looking for an LED dance floor to hire in London & Surrey? We stock a range of dance floors for rental, available in chequered, black starlit or white starlit. Our pure gloss starlit dance floor looks beautiful when laid in place. It adds that extra special sparkle, elegance and “WOW!” factor as hundreds of twinkly and sparkly white LED lights illuminate the room from within the floor below. 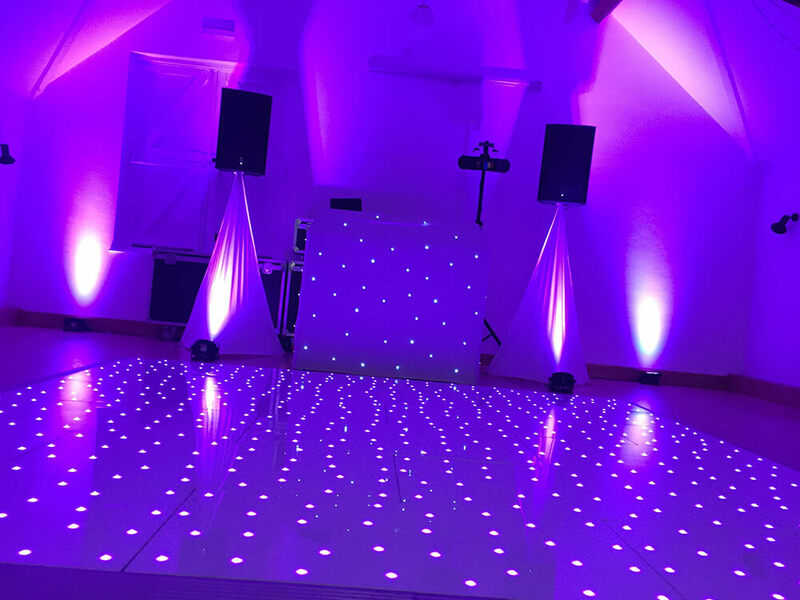 Whether you require the LED lights to remain static or flash and twinkle, the starlit dance floor lighting can be fully controlled to change the intensity and flash speed – we can even make the floor sparkle to the tempo of your first dance! In photos, in videos (and in person!) these starlit dance floors look truly magical. What happens when you hire? 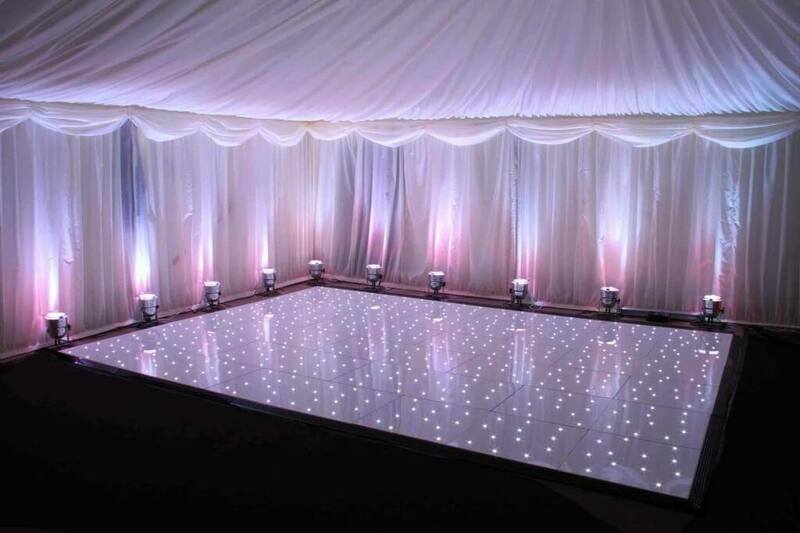 When you hire a white starlit dance floor, each floor is delivered, installed, polished and removed from your event by two of our friendly, dedicated and uniformed team, ensuring everything is taken care of. With our team taking great pride in our presentation, each white starlit floor is fully cleaned and polished prior to the start, giving a beautiful gloss and shine to the surface. When additional coloured lighting is then shone onto the white floor, the floor will magically reflect taking to the colour, changing the floors look as well as creating additional atmosphere and dimension. What sizes do you have? 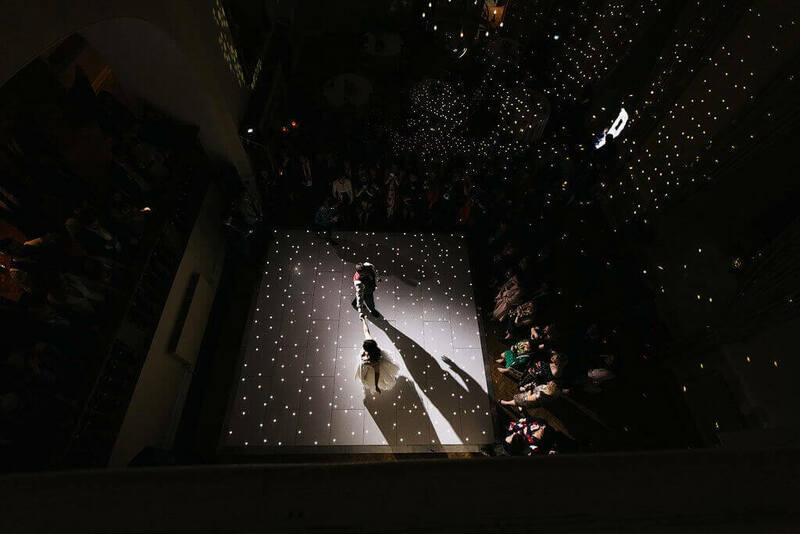 Our starlight floors are flexible in size by 2ft measurements, they can therefore be provided and installed into nearly every venue, marquee or event location. Whether you require a small, or large floor, square or rectangular, our team will deliver on time and professionally install, creating a fantastic focal and talking point at your event. We can supply our dancefloors in the following formats to suit your event. Why not drop us a call or email to discuss your requirements.